SHARKS - SHOULD WE EAT THEM? In January there was a bargain on the fish counter at Carrefour in Santa Pola, tintorera. It had been previously frozen and hence the very cheap price. I was aware that it was from the Shark family but it had a certificate of provenance from the Department of Agriculture, so I assumed it was OK.
Perhaps I should have read my posting from 4 years ago and erred on the side of caution. Stocks in and around Europe have increased following catch limitations set by the EU (and the catch in Spain is legal) but all species of shark appear to be at risk or vulnerable so should we be eating them? In his book on the Seafood of Spain and Portugal, Davidson mentions other species including the Mako (marrajo), Thresher shark (Zorro) and several varieties of dogfish but singles out the tope as being one of the best for eating and also rates Porbeagle among the highest followed by Mako and then blue shark. All of the species mentioned are found regularly in British waters (except the hammerhead which may be an occasional visitor) as well as in the Atlantic and parts of the Mediterranean. Apart from the issue of sustainability some people appear to have an aversion to eating shark "because they eat people" but generally sharks found in European waters pose no threat to humans and are not aggressive. They usually inhabit deep waters and rarely come close to the shore. I have read that there have been only a dozen recorded incidents involving people and blue sharks in the last 500 years! On the other hand, the white shark is dangerous but is not usually found around Europe and you are unlikely to find it on the fishmonger's counter. You won't find basking sharks either. Basking sharks, the gentle giants of the sea, and the second largest fish, are common visitors to the UK but are a protected species throughout the EU. There is a cap on blue shark catch in the North Atlantic as part of an international agreement but similar rules do not apply in the south Atlantic. For the present, fish caught and landed in the North Atlantic should be OK but the situation will need to be closely monitored. The biggest threat to the blue shark comes from the market for shark fins for soup in China and other parts of southeast Asia and the practice of catching them for the fins only and the bodies being tossed back into the sea. In the UK, blue sharks appear to be caught mainly for "sport" and then returned alive to the sea. 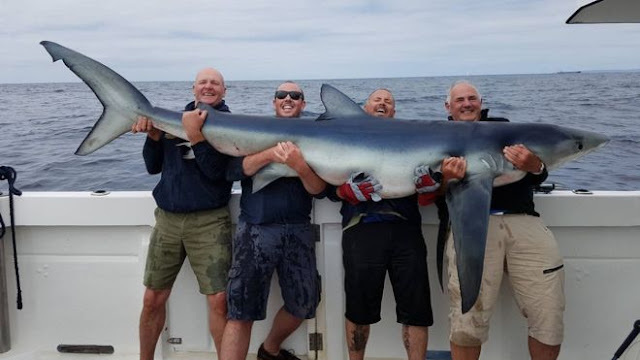 The largest on record, caught off the coast of Cornwall, near Penzance in 2017, was 9 feet long and weighed 256lb beating the previous 58-year record of 214lbs. Another reason given for not eating members of the shark family is the smell and a belief that they urinate through their skin. In my teens I regularly dissected dogfish as part of the A-Level Zoology syllabus, and can confirm that they do have a conventional urinary system. 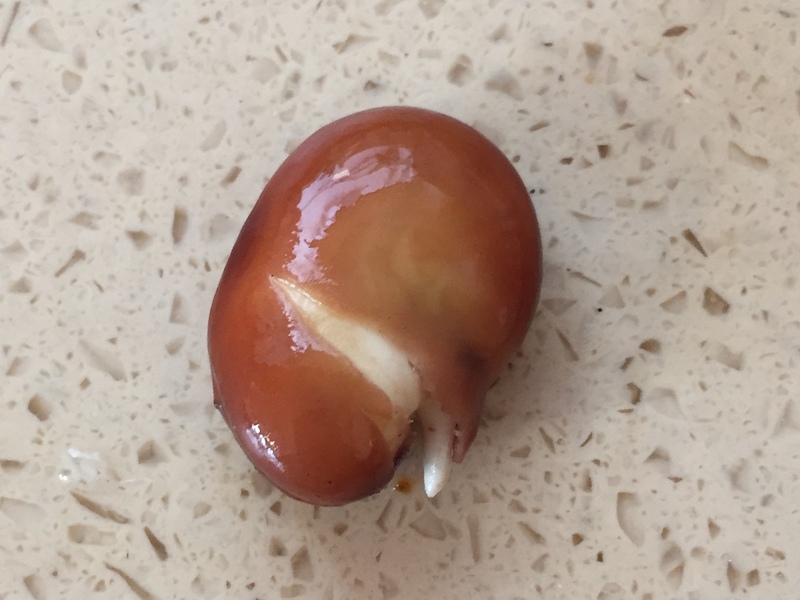 They have kidneys and a urinary duct just like any other vertebrate and excrete quite a lot of waste products in their urine in the normal way. So what is the myth about them urinating through their skin? All fish have a problem that their blood and body fluids are less salty than the sea and therefore they lose water through osmosis. Bony fishes overcome this by constant drinking of water and passing it over their gills to get rid of excessive salt and they excrete nitrogenous waste in the form of ammonia, which is a very toxic compound. The cartilaginous (non-bony) fish such as sharks, on the other hand, convert ammonia to less toxic urea which is stored in the blood and prevents the loss of water through osmosis. Unlike bony fishes they do not have to constantly drink water and they excrete nitrogenous wastes as urea, which is less harmful to the environment than ammonia. In a live shark, ammonia doesn't accumulate because it is quickly converted to urea. When the shark dies, however, the urea breaks down forming ammonia, which is why fresh shark meat and other cartilaginous fish, such as skate (rays) may smell of ammonia. Sharks which are bled when caught and cut into steaks are less likely to have this smell when they reach the fishmonger. The cartilaginous fish eaten mostly in the UK are dogfish (usually marketed as Huss, Rock Salmon or Flake) and skate. Some cookery books suggest eating skate when it is one or two days old when the ammoniacal smell will have disappeared or soaking the flesh in water or lemon juice before cooking. Others say this is unnecessary as the smell indicates that the urea has been converted to ammonia and that in any smell, and the ammonia itself, will disappear in cooking. So long as stocks remain sustainable, I for one will continue eating skate but will check the species and source. And of course, the one big advantage of eating cartilaginous fish - and a great plus with children (and me) is they have no bones! March comes in like a lion and goes out like a lamb according to the old proverb and the February snow was still around as we entered March. In the 19th century, however, the proverb was used as a prediction depending on the weather in early March - If March comes in like a lion, it will go out like a lamb. Let's hope so, as the early March weather was cold, windy and wet and no better than February. As the weather in late February and early March were not conducive for work on the allotment, I began to sow some seeds indoors. I soaked the broad beans in water indoors leaving them in the warm for a couple of days to give them a head start and then planted them in trays in the unheated conservatory. By 5 March the snow had gone and I managed to get up to the plot to assess the damage. Sadly, during the snowy period and its aftermath, the pigeons had devastated the purple sprouting broccoli. I must remember to net the broccoli next year before the florets form. The other good news was that the garlic, onuions and shallots were doing well, although in need of some hand-weeding. And when I went to weed and rake over one of the empty beds where carrots and parsnips had been grown last year, I noticed some fresh green growth - in clearing the bed, we had left a parsnip behind! I suspected it would be tough and woody, but surprisingly it wasn't and was a sweet and delicious addition to our Sunday roast! I tried to do some digging to remove the couch grass from the uncleared areas but this proved impossible on a clay soil that had seen so much rain. But I did manage to dig two shallow trenches about 3 - 4 inches deep, on an area previously cleared, to plant my first early rocket potatoes which had been chitted in the allotment shed. I then covered them with soil and will rake more soil over as the shoots begin to show to ensure they are completely covered until the risk of frost has reduced. The rhubarb was also showing through at the beginning of March but doesn't look as healthy as on the Mile Oak allotment from where it was transplanted. I think we should have given it a good mulch of manure in the autumn. We have provided it with some nutrients from the wormery and have applied a mulch. So a few more days were lost! By the week-end the snow had cleared and there were a couple of dry sunny days. Sylvi and I managed to clear a little more and we were able to plant a row of 2nd early Nicola potatoes. I also managed to clear an area of nettles and plant the third and last redcurrant bush to be transferred from Luke's old plot at Mile Oak. There had been a delivery of fresh bark and wood chippings which gave us an opportunity to mulch some of the fruit bushes and start to renew and repair the paths. With the brief period of sunshine came another ray of good news - despite the best efforts of the pigeons to destroy my crop, the broccoli showed some resilience and sprouted again and we had a modest picking of one of my favourite vegetables. We were very far behind due to the weather but managed to draft in family members for the last Sunday before Easter and they did sterling work. Luke and Sylvi did most of the heavy work, digging out brambles, bindweed and couch grass; Nicole did a great job of hand weeding the garlic, onions and shallots; Jerome brought 5 or 6 wheelbarrow loads of chippings to repair paths and to go between the raised beds and Letty provided much needed massage for all our weary limbs. Things are looking much better and we felt more optimistic (despite weather warnings of more snow for Easter). I also managed to plant out the broad beans which I had sown at home and hardened off in the shed. I used these to fill in the gaps where we had lost the plants which we had sown in January. For the Easter weekend 30 March - 2 April we went to Sheffield for a family event and almost got snowed in on the Sunday night/Monday morning with 0C temperatures - fortunately when we returned to Hove on the Monday, 2 April, there had been no snow and the temperature was 8C - but there had been more rain! Before Good Friday, however, I had managed to plant another row of Nicola potatoes, a row of perpetual spinach, two rows of carrots, a row of parsnips and two double rows of Kelvedon wonder peas. Indoors I also sowed some cavolo nero and early summer sprouting broccoli. Let's hope the weather is conducive to planting out in April!